If you look hard enough, technology is everywhere. You can consider this article a look at the various cool things people are doing, kind of like a bigger Daily Digest, except a little more serious. I don't expect everything in this article to be useful to any one individual, but at least some of it should be. Old Pyromancer or overrated mythic rare? I think it's incredibly powerful and just needs a good home. Two-time Pro Tour Top 8-er Yuuki Ichikawa seems to think so too. This deck is great, and it actually bears some resemblance to the deck that just won the StarCityGames Modern Open in Baltimore. It's all about playing the "protect the queen" gameplan and disrupting our opponent in between. I'm not at all surprised to see Sorin, Lord of Innistrad alongside Lingering Souls and Monastery Mentor. 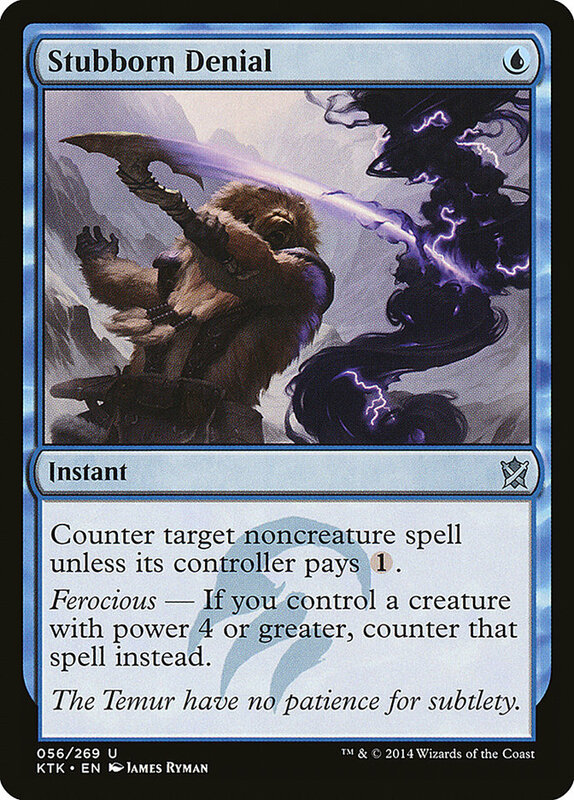 Slaughter Pact is pretty awesome with Monastery Mentor, as is the Thought Scour engine with Murderous Cut and Snapcaster Mage. Curse of Death's Hold popped up in Florian Koch's Grand Prix Vancouver deck, and I like that if you're also on the Lingering Souls train. Using things like Zealous Persecution will only deal with what's in play, but since the games tend to be rather grindy in Modern, I like having a haymaker at the top of my curve. I don't think we've seen the full potential of this style of decks. Anyone looking to gain a potentially large edge in Modern, Legacy, or maybe even Standard should definitely look into Monastery Mentor. 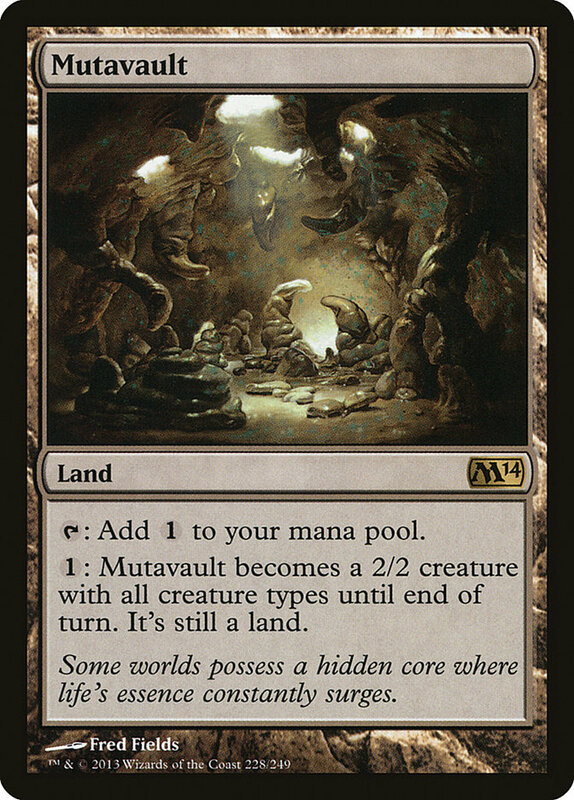 Wait, since when is Mutavault considered technology? We've seen Tempo Twin, but this is a whole other angle. Lots of counterspells, minimalistic combo pieces, and Mutavaults give this deck an entirely different feel to it. Even if you are playing Tempo Twin, Mutavault is something you might want to consider over the Tectonic Edges the deck usually plays. Regardless of the variant of Twin you're playing, the deck is often starved for some sort of filtering tool, so Desolate Lighthouse might be a difficult cut, but Mutavault might be better with the Plan B.
Splashing white instead of green is something we're seeing, mostly due to a lack of Affinity and the sharp uptick in Burn. Timely Reinforcements is a nice buffer in a matchup that's already relatively close, and Wear//Tear does a reasonable Ancient Grudge impression against non-Affinity matchups. Daisuke chose to play Hurkyl's Recall because he was still worried about Affinity, but that's a call you're going to have to make. Humble Defector is rather insane with Pestermite or Deceiver Exarch, but I wasn't a huge fan of the discard spells. In theory, an Inquisition of Kozilek should protect your Defector, but if Defector is playing the role of Spellskite, that's fine with me anyway. If I get to draw four cards, I want stuff that's going to interact with the board, not a discard spell that is going to be largely useless if they simply ship the Defector back. Obviously you don't mind them doing that too much since you can abuse the Defector far better than they can, but I'd still rather have a Path to Exile (which can also work with Humble Defector if necessary). White, as I mentioned earlier, also offers some great sideboard options. With a version of Twin that is less combo-oriented, getting that extra turn against Burn with Timely Reinforcements is even more important. The verdict on this deck is still out, but I look forward to drawing my own conclusions. 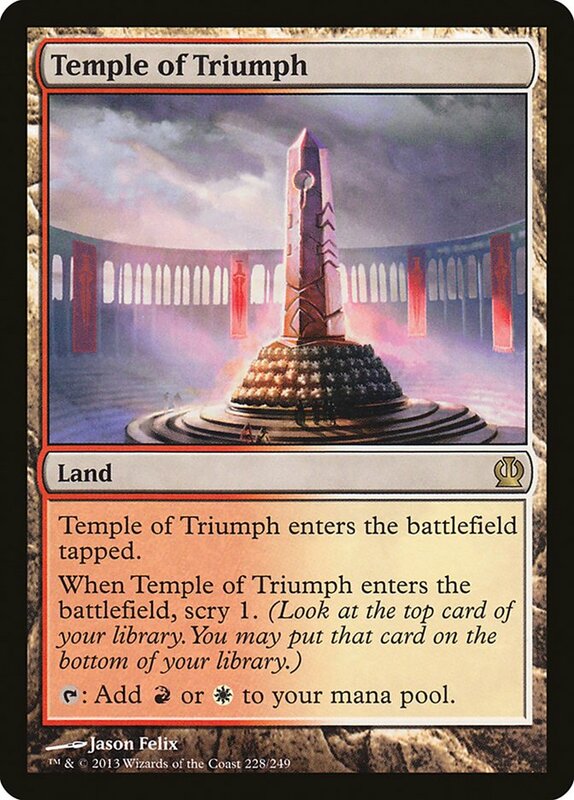 Temple of Triumph, really? That's not technology! You are correct, but people are doing crazy things to their Temple of Triumph decks in order to gain an edge. They used to have it based on deck strength, but now people have adapted, and it's time to try something new. This is an innovative list that uses Dictate of Heliod instead of Stormbreath Dragon, and that's something I can get behind. I'm even somewhat surprised to not see Monastery Mentor, but Brimaz, King of Oreskos might do a better job. Between Dictate of Heliod, Outpost Siege, and Hammer of Purphoros, you should be able to go long against any control deck not packing Perilous Vault. I realize this deck doesn't actually play Outpost Siege, but it definitely should. It lives up to the hype. Chandra, Pyromaster is nice, but Outpost Siege really is better the vast majority of the time. 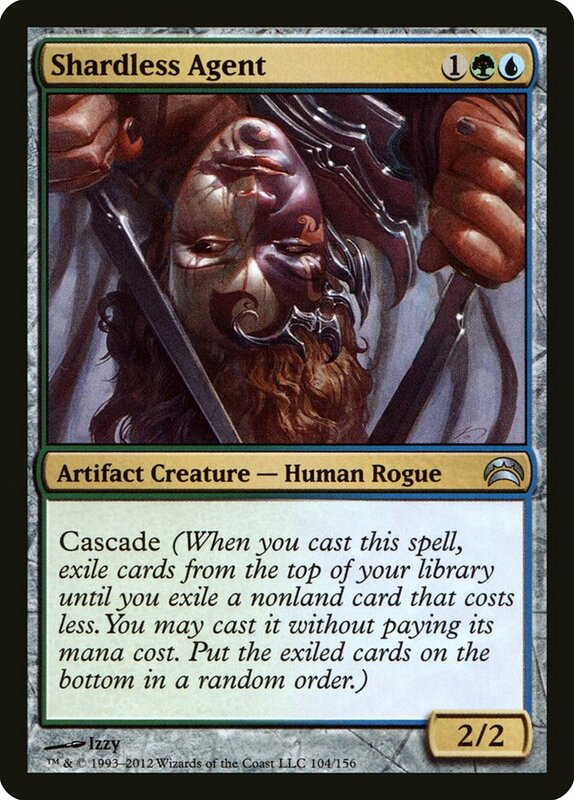 Another card that I've seen popping up in sideboards is Mob Rule. Against anything that's spewing a bunch of permanents into play, such as G/X Devotion, Mob Rule is a pretty insane finisher. Some people try to use End Hostilities to sway things back in their favor, but outright killing them has to be better. The biggest piece of technology to come out of R/W is Mastery of the Unseen. It's slowly expanding out into other decks, and it won't be long until U/B Control is all but pushed out of the format. If you don't want to play a longer game with Mastery, I think you should try sideboarding Eidolon of the Great Revel. It's fantastic against Abzan and other controlling decks, especially if you're on the play. Naturally, you'll need to remove Siege Rhinos and the like so that your card doesn't backfire on you, but that was part of your gameplan already. Frontier Siege is clearly a very powerful card. For four mana now, you get four green mana for each of the following turns, which is probably something you should be able to abuse. However, despite Frontier Siege showing up in some decks, no one seems to be able to figure out how to use it the most effectively. Maybe there isn't a way. This issue with Frontier Siege, especially in decks like this, is when you play Frontier Siege into a seven or eight mana spell and they deal with it, you're left with a bunch of mana but not a lot of action. If you use Frontier Siege to play a four and a five-drop on the next turn, you're not much better off than if you just played the four-drop instead of Frontier Siege and the five-drop the next turn. One option is to use Frontier Siege alongside a bevy of expensive spells, but what happens when you don't draw Frontier Siege or they kill it? Modal cards, like Genesis Hydra, appear to be one of the best fits for a Frontier Siege deck, but the devotion decks already have Nykthos, Shrine to Nyx for mana acceleration, plus they're a little too fast. They'd rather not take the turn off to play Siege in the first place. This isn't all about Frontier Siege though. Colossus of Akros is also an interesting card and it's quietly hiding out in the sideboard. Ugin, the Spirit Dragon? Couldn't care less. Hero's Downfall? A joke. I actually Sultai Charmed one of these online. That didn't work either. Palace Siege is another card that's been picking up some steam. The Syphon Soul mode is a reasonable clock against basically anyone, and although the Raise Dead mode comes up less often, it's typically a game ender when it does. Overall, I think there are better options, but I appreciate the creativity. Silence the Believers is a fantastic sideboard option. Ashcloud Phoenix is on the decline, which is why I was originally playing the card, but despite that, I've still been happy playing it. If you're in the market for another removal spell, you either want it because you need to kill something on the cheap or because you want extra removal against big creatures. Against small creatures, you'll want something like Bile Blight, Pharika's Cure, or Drown in Sorrow. This isn't exactly some cheap removal against big creatures unless you want something super narrow. If the mana cost being prohibitive isn't an issue, there is nothing better than Silence the Believers. You'd be surprised how quickly removing a pair of Siege Rhinos will turn the game around for you. If you are interested in playing G/B Devotion, I recommend trying to fit some Radiant Fountains into the manabase. There are some issues with the GG and BB mana costs in the deck, but there are several dual lands, and I think the deck could afford to be a little greedier. One of the biggest issues G/B Devotion always had was that, despite all the mana acceleration, it always felt a turn too slow. By playing a Radiant Fountain or two, you might have a free way to make up that turn. Another cool thing you can do is sideboard into a control deck. I think it's actually a viable option here and is something I've looked at with similar decks, such as Sultai Reanimator. Basically, you board out your medium threats against decks that go over the top of you for Thoughtseize, Read the Bones, and sweepers. Against something like G/X Devotion, you're probably better off looking like a crappy Abzan deck than sticking to your main gameplan, and it doesn't take many slots. I like John's take on things and was sad to see he didn't fare so well in the tournament. I definitely like the "go over the top" aspect, as that's something that Frontier Siege wants to be doing. By ramping with Frontier Siege, you're kind of saying "I'm not interested in fighting small battles," so spot removal is a little too small ball for what you're trying to do. Instead, John used Aetherspouts and things like Hornet Queen to deal with creatures. That allowed him to stick to just two colors, and I really like that approach. If you're interested in more, you can check out his deck tech here. With Jund's Top 8 at the StarCityGames Open in Baltimore last weekend (and Abzan nowhere to be seen), it might be time for it to reclaim its place as the king of midrange. Hugo's deck is more traditional, but the big thing here is the return to Jund and the return to Dark Confidant, in general. I'm a little surprised to not see a bunch of spice in these lists actually, because there has been a lot of technology popping up for these Jund decks. Reid has Thundermaw Hellkite, whereas Hugo has Olivia Voldaren, both of which are great draws to play Jund over Abzan. I'm a little wary of Lightning Bolt's place in the format, and I'm especially worried about it being in the deck that definitely wants to remove Tarmogoyf and Siege Rhino, but with the uptick in Burn and Infect, it might be where you want to be. I've personally been experimenting with lists that include Birds of Paradise and Goblin Rabblemaster. One of the Japanese players from the above tournament had three copies of Bonfire of the Damned in his list, and those seemed like a good addition to my deck as well. They aren't great against decks like Twin or Burn, plus it's difficult to kill a Tarmogoyf or Siege Rhino with one, but they are certainly good against Lingering Souls. With the advent of Tasigur, the Golden Fang, and to a lesser extent Gurmag Angler, we might be seeing this card in Legacy and Modern. It might also breathe new life into Death's Shadow, which I'm excited to work on again. I don't have a decklist to share currently, mostly because I could tell the ones I've tried so far aren't quite there yet. They have shown promise, and I'll be working on them soon. At some point, I'll be updating the primer to this deck, because I think it's back, and I think it'll be a big contender. For my updated list, I recommend you check out my video that's going up next week. In the meantime, I just want to talk about a couple of cards that I think are great. The first is Arcane Laboratory. Omni-Tell has mostly supplanted Sneak and Show as the Show and Tell deck of choice. That's incredibly helpful for us, because it means that we have a card we can play to hose Storm and Show and Tell. I already play a Null Rod because of Miracles and Storm, and finding sideboard cards that overlap in many different matchups is often the key to success with a reactive archetype like this. I think Arcane Laboratory could have a use against Elves as well, but it might actually hamper your gameplan more than theirs. It requires more testing. The second card is Dig Through Time. It's pretty easy to just slot in a couple copies and call it a day, but it's not that simple. Delve is a cost, and in this deck, it's a larger cost than in most. You're always using your graveyard for Deathrite Shaman and Tarmogoyf, and with other blue decks having access to Dig Through Time as well, you can't rely on backpacking off their graveyard as much as you used to. I do think the deck can support one or two delve cards, but it's possible Tasigur is just a stronger card overall. Despite that, Dig Through Time might actually be better for the deck simply because it's a blue card. I've only played a handful of matches with both at this point, so it's too early to tell definitively.